Good morning! We're hosting a March Madness bracket and you're invited. Winner gets: Fanatics apparel item up to $200 in value (jersey, sweatshirt, etc). P.S. We're also re-launching our daily prediction contest today. Check it out at the bottom of the newsletter. The last time the NCAA women's basketball tournament felt this wide open was in 2006, which is also the last time UConn wasn't a No. 1 seed. The Huskies missed out on a top seed due to their weak strength of schedule (31st) and losses to Baylor and Louisville, the latter of whom is in their region. Talk about bulletin board material for a program that has rarely needed any. Pray for Towson, their first-round opponent. First-round: The action tips off on Friday at noon ET, when Louisville takes on Robert Morris. Best streak: Tennessee (19-12) snuck into the field despite a down season and has now made the tournament 38 years in a row. Best matchup: No. 5 Rice and No. 12 Marquette will be fun. Marquette has the nation's fourth best offense at 82.9 points per game, but Rice only allows 52.8 points. Something's gotta give. Who to watch: Hopefully, by now, you've read about Bella Alarie — future WNBA superstar. Her Princeton Tigers play Kentucky on Saturday. P.S. The schedule was set to be released on ESPN at 7pm ET, but it was leaked nearly four hours early by ... ESPN. They scooped themselves. European soccer clubs will meet with UEFA today to discuss radical changes to the Champions League that would favor the continent's richest teams and make it harder for smaller teams to qualify, the Wall Street Journal reports. Why it matters: The Champions League is the most prestigious tournament in club soccer, drawing a massive global audience and paying out tens of millions of dollars to participating teams. Any changes to its format would be felt throughout the soccer world. Matches being moved from their midweek slots to the weekend. The big picture: For decades, there have been rumors that Europe's top clubs might break away from the current structure of club soccer and form their own "Super League." That conversation heated up last fall when leaked emails showed that seven of them — Real Madrid, Barcelona, Bayern Munich, Juventus, AC Milan, Manchester United and Arsenal — had seriously explored the idea as recently as 2016. The bottom line: While these proposed Champions League changes wouldn't create a separate "Super League," they would essentially turn the Champions League into one. Japanese Olympic Committee chief Tsunekazu Takeda, who is under investigation for suspected corruption, will step down when his term ends this summer and resign from the International Olympic Committee. Details: Takeda is suspected of paying bribes to secure the winning bid, though he claims he did nothing wrong (because of course he does). Go all the way back to 1900. 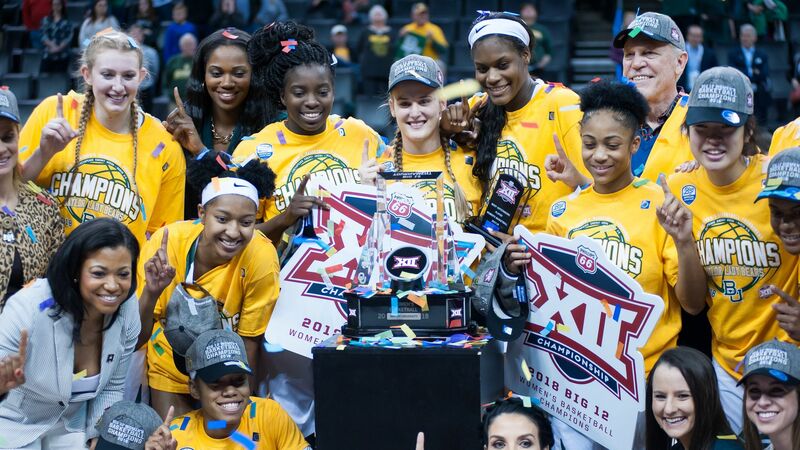 From Mike: Before you and your office buddies print out your brackets and start gathering cash from co-workers, we should warn you: this is technically illegal. Here's why: It's a restriction on sports betting in the same way PASPA was, so each state has to affirmatively make pool betting legal. Only 13 states have: Washington, Montana, Wyoming, Colorado, Arizona, Texas, Minnesota, Iowa, Alabama, Kentucky, Ohio, Connecticut and Maine. The big picture: The American Gaming Assocation projects more than 40 million people will wager $4.6 billion on 149 million total NCAA tournament brackets this year. That's not even counting the billions that will be spent on entry fees. 40% of those entrants think office pools are legal and 38% of them are unsure. Only 22% know they're illegal, per research from the Mellman Group. The bottom line: Don't worry, you aren't going to jail. Not for this, at least. We can't help you with that other thing. 24 years ago today, Michael Jordan rejoined the Chicago Bulls starting lineup after nearly a year and a half away from basketball, putting up 19 points, 6 assists and 6 rebounds in a loss to Reggie Miller and the Indiana Pacers. The Tampa Bay Lightning clinched the Presidents' Trophy (best regular-season record) with a 4-1 win over the Arizona Coyotes last night. Question: Who was the last team to win the Presidents' Trophy and the Stanley Cup in the same season? Hint: It happened during the 2012-13 season. You know what's better than winning the Bassmaster Classic? Doing it in your own backyard. That's what Knoxville native Ott Defoe did this weekend in the Tennessee River. 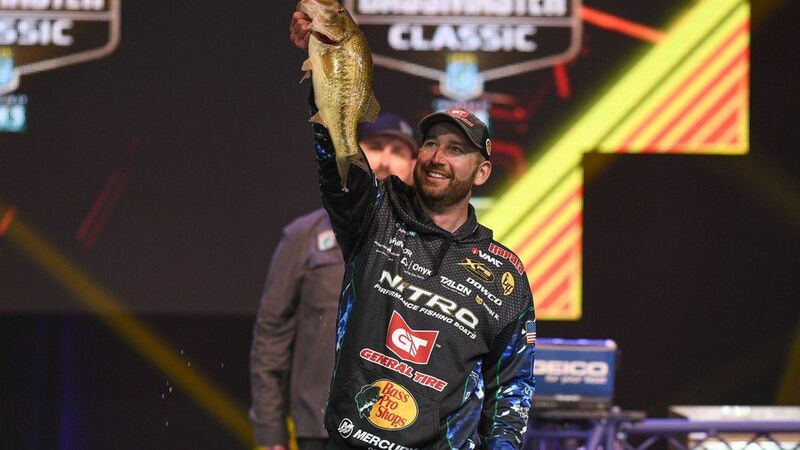 Defoe finished the three-day event with 15 fish on the line and a final weigh-in of 49 pounds and 3 ounces, taking home $300,000 in prize money for his efforts. Fun fact: For the first 36 years of the Bassmaster Classic, no home-state angler claimed the top prize. Now it's happened four times in six years. 9. ♜ "Talent is universal, even if opportunity is not"
"So we should all grin along with Tanitoluwa Adewumi, the newly crowned chess champion for kindergarten through third grade. He went undefeated at the [New York] state tournament last weekend, outwitting children from elite private schools with private chess tutors." "Tani is a reminder that refugees enrich this nation — and that talent is universal, even if opportunity is not. Back in Nigeria, his parents say, his brilliance at chess would never have had an outlet." 10. 🎰 Axios Pick 3: Make your picks! Welcome to Axios Pick 3, our new-and-improved daily prediction contest powered by The Action Network (download the app). Each morning, you'll have the opportunity to predict what will happen in that evening's games. Winners get prizes (this week: Axios swag). 1. Which team will cover the spread in the Prairie View A&M-Farleigh Dickinson (-2) game? Betting 101: Farleigh Dickinson is a two-point favorite, so they must win by more than two points to cover the spread. Prairie View A&M is a two-point underdog, so they must lose by fewer than two points (or win) to cover. 2. Will Temple-Belmont go Over or Under 155.5 total points? Betting 101: By choosing the "Over," you're predicting that these two teams will combine for at least 156 points. By choosing the "Under," you're predicting that they will combine for 155 points or fewer. 3. Will any player score 30 or more points in the play-in games tonight? Know this: 30-point games this season: Belmont (9), Temple (3), Prairie View A&M (2), Farleigh Dickinson (2). Make your picks by 6:40pm ET.